Thank you for taking time to fill a Thanksgiving bag or two to help fellow Twin Cities families round out their Thanksgiving meal. Please return those bags to the ministry art in the Commons by this Sunday, November 4, after the second service. Misplaced the grocery list? Or, perhaps you forgot to pick one up? It’s not too late to help out! Click here to view the shopping list. 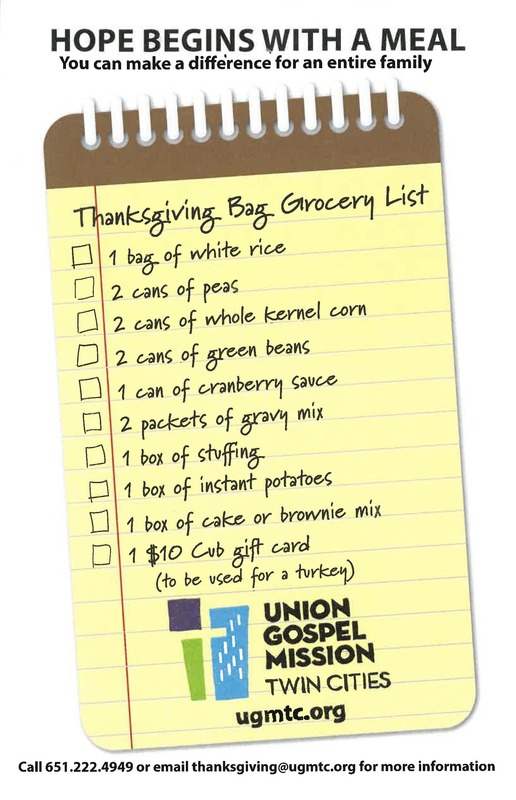 The Union Gospel Mission in St. Paul also has several serve opportunities that allow you to meet the people who receive Thanksgiving bags. These opportunities are easy to fit into your busy life. You won’t be the same after interacting with these appreciative people who receive your food bags. This weekend we celebrate with the families who are taking the first step in their child’s spiritual journey. Family dedications are a time for the church to prayerfully join these families in raising their children to become followers of Christ. Worship Arts Tech Open House this weekend! Are you curious about what goes on in tech ministry? Ever wondered what happens behind the scenes of our weekend worship? Join us for a “lunch & learn” open house on Sunday, November 4, 12:30 pm in room 101. If you like what we do, or have ideas of how we could be better, we’d love to meet you and hear your feedback! Come find out how you can support this very imortant ministry! Lunch is on us, so come hungry! Questions? Email Harold Ennulat, hennulat@fiveoakschurch.org. Our Lost and Found, located at the Welcome Center, is overflowing. If you are missing something, please stop by the Welcome Center to see if it has been living there. All unclaimed items will be donated November 4. Are you interested in our church’s vision? Join us for our annual congregational meeting on November 11 at 4 pm. We’ll open with worship music, then hear some vision casting from Pastor Henry and ministry leaders, followed by the budget and elections. This is an opportunity to peek behind the curtain at the “why” and “how” our ministries are growing! At the end of this short meeting, we’ll enjoy fellowship and heavy appetizers together. Last year’s meeting minutes, this year’s nominee profiles, and the 2017 audit report are available for your review at the Welcome Center. If you call Five Oaks your church home, your participation is vital to make this process work. If you’re new here, you may wonder how best to get connected. We have a simple first step, called Pizza with the Pastor. This one-hour lunch with Pastor Henry will allow you to ask any questions about Five Oaks and get you started connecting with others. FREE childcare and a FREE pizza and salad lunch. Sunday, November 11, after the second service. Please email Kelsey Vang, kvang@fiveoakschurch.org, to register. Will your grandchildren visit you over the holidays? Hey grandparents! If you plan to bring grandkids or other young visitors to Five Oaks during their visit, you can help us make their visit easier by pre-registering your grandkids in our system well ahead of their arrival. Please stop by the Welcome Center anytime to get them pre-registered. It will only take a few minutes now and will help speed up your arrival during their visit! Our worship team is committed to creating worship gatherings that deepen your faith and encourage you to bring the light of Jesus wherever we go. Knowing that the pace of life pulls us all in many directions, we’ve decided to postpone the Five Oaks Worship Night to January. We look forward to prayerfully preparing for a rich night of worship with you after the New Year. Stay tuned for more details! Join in fellowship alongside your neighbors as Christian churches in Woodbury gather together to celebrate this Thanksgiving season. We’ll hear from a representative from the Christian Cupboard Emergency Food Shelf as well as a representative from the Woodbury Mayor’s office. Your whole family is welcome! We’ll even have a message for children during the service. Wednesday, November 21, 7 pm, St. Ambrose Catholic Community, 4125 Woodbury Drive.